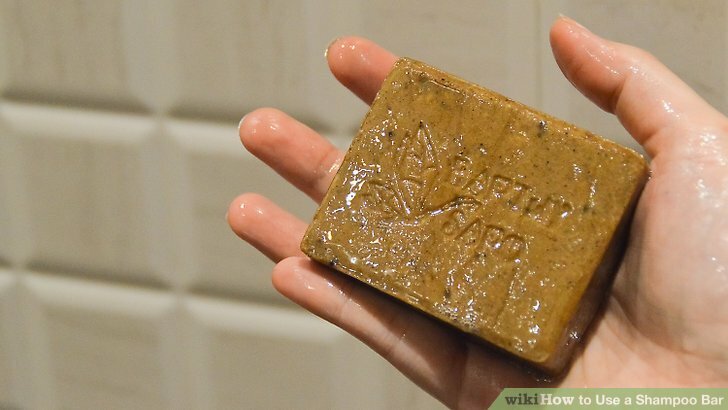 A shampoo bar is a solid, eco-friendly alternative to liquid shampoos. They can last for a long time (around 80 washes), and they do not harm the environment since they do not come in plastic containers. In addition, a shampoo bar is a great idea for traveling since they are solid and compact. You can choose a shampoo for any scalp need, including removing oils, helping dandruff, or hydrating the follicles. Simply wet your hair, rub the bar over your scalp, and lather up! Wet your hair in the shower. 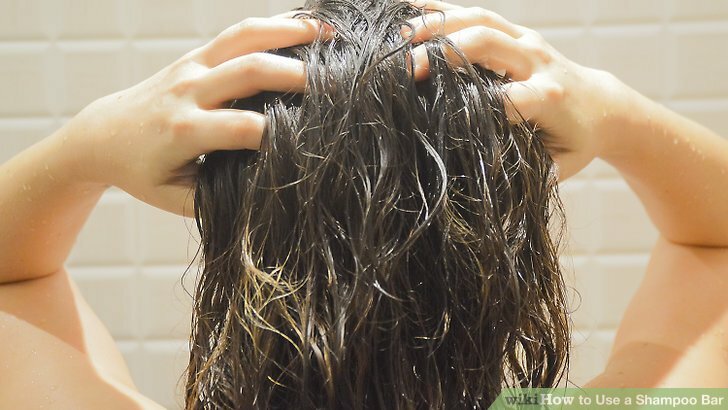 Rinse your hair in warm water from your shower so it is completely saturated. The wetter your hair is, the easier it is to apply the shampoo. On average, this should take about 1 to 2 minutes. Get your shampoo bar slightly wet in the shower. To easily apply the shampoo, it is helpful to lather it up slightly before use. Hold it under the stream of water from the shower head and rub it around in your hands. You can also warm it up in your hands a bit as you get it wet. Do this for about 10 to 30 seconds. Rub the shampoo bar directly onto your scalp with gentle pressure. Once the shampoo bar is slightly wet and warm, bring the bar to the top of your head. Rub the shampoo bar back and forth across the top of your head until your hair and scalp are very soapy. If you have very thick hair, you may also need to part your hair down the middle and/or ear-to-ear so you can reach all areas of your scalp. The amount of shampoo you need will depend on your particular hair type. On average, you have enough shampoo when your scalp is very sudsy. Work the shampoo through your hair after it is lathered up. Once your scalp is covered in a base layer of soapy bubbles, focus on massaging the shampoo into your scalp. The shampoo will move on its own to the ends of your hair. Evenly distribute the product across all of your hair for a thorough clean. For a massaging effect, move your fingertips (but not your nails) back and forth across your scalp as you do this. If the shampoo bar you are using has essential oils in it, this helps the oils penetrate into your scalp. Rinse your hair completely. Once your scalp and hair are clean, place your head under the stream of water, and wash out the shampoo bubbles and residue. Continue rinsing your hair until all of the shampoo is removed. This may take a few minutes depending on how thick your hair is. Use a conditioning bar if you want extra nourishment. Commonly, all you need is a shampoo bar to get soft, silky hair. However, you can also use a conditioning bar in place of liquid conditioner while you’re on the zero-waste lifestyle. To use, rinse your hair, rub the bar onto the middle section of your hair, and distribute the conditioner to your ends. Then, rinse the conditioner out thoroughly. If you want a more thorough conditioning option, let the conditioner sit on your hair for 1 to 5 minutes. Do not apply the conditioner to your scalp because it may cause your hair to look and feel greasy. While you can surely use liquid conditioner if that is what you prefer, conditioning bars work great to soften and strengthen your hair. Let your shampoo bar dry completely before putting it away. After your shower, place the shampoo bar on a clean towel for 5 to 20 minutes so it can dry completely. If you put the bar away when it is still wet or damp, it will disintegrate over time. Avoid leaving your shampoo bar in the shower. You can also place your bar on a small dish or on top of your other cosmetic bottles. 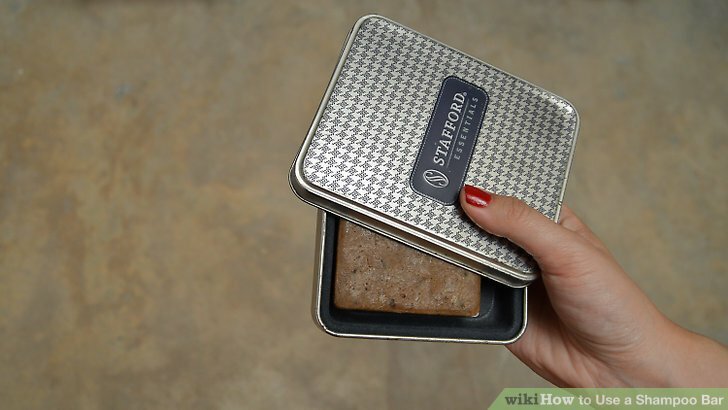 Place your shampoo bar in a reusable tin for long-term storage. Purchase a reusable tin to the size of your shampoo bar. Then, place the dry shampoo bar inside to keep it clean and preserved. Shampoo bars work great whether you are on a road trip, flying to a vacation getaway, or taking a train across the country. To prevent the shampoo bar from sticking to the bottom, cut a piece of wax paper to the size of your tin, and place it along the bottom. Then, put your shampoo bar on top. 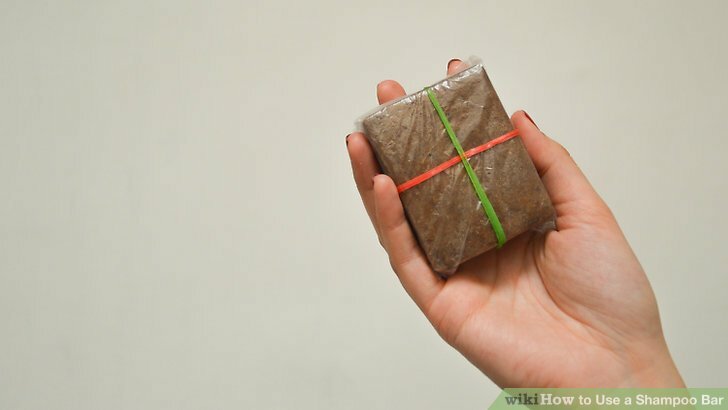 Wrap your shampoo bar in a plastic baggie as a water-tight option. 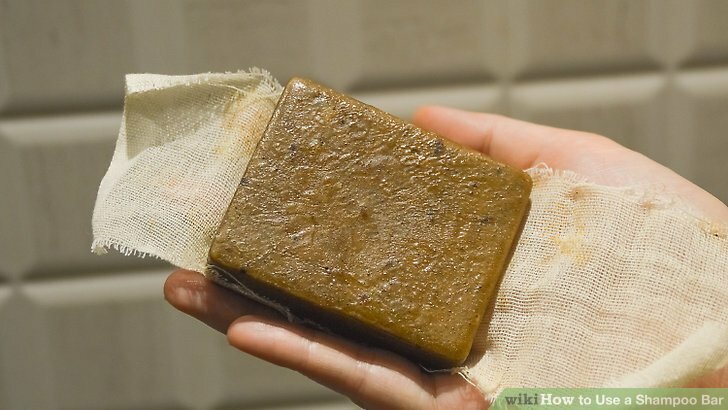 To preserve your shampoo bar without using a tin, place it inside of a clean plastic bag when the shampoo bar is dry. Then, wrap a rubber band around the top several times to keep out any air. As an alternative to a bag and rubber band, you can also use a resealable bag, such as a Ziploc bag. Keeping the shampoo bar in a plastic bag seals out any moisture, so your shampoo bar will stay fresh in between uses. Use your shampoo bar until it runs out. On average, a shampoo bar will last about 80 washes, depending on the frequency of use and your hair type. Since the shampoo bar is all natural, you don't have to worry about it going bad. Simply use the bar until it disappears! Your hair may feel slightly waxy after the first few times you use a shampoo bar. This is absolutely normal. Shampoo bars are made from all-natural ingredients, and it takes some time for your hair to adjust if it is used to chemical shampoos. Once your hair dries, your hair will feel soft and lovely! After using a shampoo bar over time, you may not need to wash your hair as often. It is common to go 2 to 4 days without washing your hair. You can also use a shampoo bar as a body wash, laundry detergent, or hand soap, but it won’t last very long if you use it for all of these things.